Jamie here! 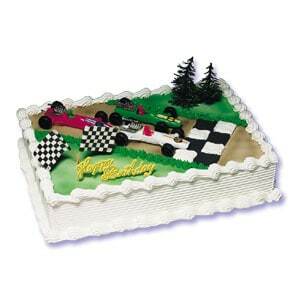 If you have little boys, at some point in time you will likely end up making a race car cake. This ^^ is NOT the cake I made for my 6 year old’s birthday party, but it is the cake he wanted for his 6th birthday. 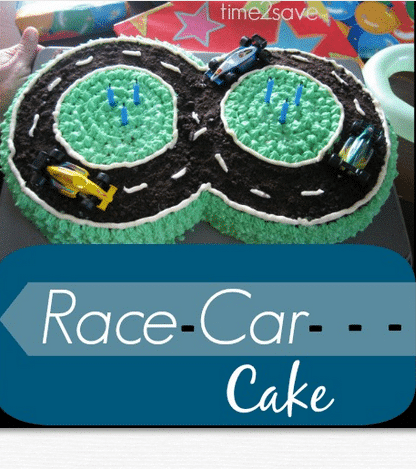 I hate the taste of grocery-store cakes almost as much as I hate paying for them, so I decided to make my own race car cake. Set them side-by-side and shave off a bit of the edge of one round, so that the other round can fit into it like a puzzle. Make 1 batch of buttercream icing*. Leave about 1/2 cup white, and dye the rest green. Pipe or spread the green icing to cover the whole cake. Put several Oreos or other chocolate cookies (minus the cream filling – I’m sure you can think of some great ways to get rid of that 😉 ) in a ziploc bag and use a rolling pin or a glass to crush them. Put crumbs in a cup, and pour slowly into a figure 8 pattern, pressing into the icing as you go. I put a small bowl in the center of the cake to give me a good circle outline to pour around. After all your pouring and pressing, it still won’t have a perfect edge, but that’s where your white icing comes in. Pipe white icing to outline your track, and add little road lines while you’re at it. Stick some cool new cars on top, that will double as presents later! Since the party had a race car theme, we made a pin-the-tail type game for the neighborhood kids to play. We used a big posterboard and made a race track on it. The Finish Line was the target, and all the kids got micro machines with a wad of packing tape rolled underneath. Blindfold, spin, and send them wobbling towards the prize. If you don’t have micro-machines, obviously paper cars will work fine. Soften butter at room temp for awhile, or set on the stovetop while the oven preheats- don’t get it too melty though. Beat the powdered sugar into the butter+milk a bit at a time, so you don’t find yourself in a powder cloud. Add the vanilla. If it’s still too dry, put in another spoon of milk.